“Other than the service of those who wear the uniform of the United States especially our cherished fallen, the ministries that you lead and the prayers that you pray are the greatest consequence in the life of the nation,” the vice-president told those attending the 2018 Watchman on the Wall conference sponsored by the Family Research Council. “Keep preaching the good news. Keep preaching in season and out of season as the Bible says. Always be prepared to give a reason for the hope that you have,” he continued. 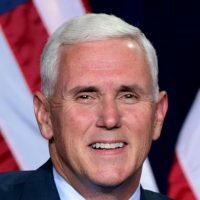 At one point, Pence shared his Christian testimony, a life-changing moment that came at a Christian music conference in Wilmore, Kentucky back in 1978 at the end of his freshman year in college.